Bluesound Pulse Flex 2i review | What Hi-Fi? If the Pulse 2i is Bluesound’s Schwarzenegger – bold, powerful but somewhat inexpressive – the Pulse Flex 2i represents its DeVito multi-room twin: short, stocky and fun, though with a serious side too. Price was a significant factor when we reviewed our verdict on the original Pulse Flex earlier this year. Not so much that its tag is huge, but that it put Bluesound’s most affordable multi-room speaker in the firing line of some seriously stiff competition. We hadn’t lost our affection for the Pulse Flex, so it was positive news when we learned Bluesound’s focus was on upgrading connectivity, with otherwise minimal tweaks to improve the performance without altering its original character. The Pulse Flex 2i now supports Alexa Voice Control and Apple AirPlay2 – updates that have happened across its new suite of multi-room components. The only technology not trickling this far down the line is two-way Bluetooth, which enables the rest of the range to be paired with wireless headphones. Beneath the lid, the Pulse Flex 2i much resembles its predecessor with a 25mm tweeter and 9cm woofer driven by an impressive 25W of bi-amplified power. Physical connections include an analogue/optical in (there’s a Toslink optical-to-3.5mm adapter included in the box), USB type-A port and a headphone out, plus an ethernet port for network hardwiring and a mini-USB port for servicing. There’s wi-fi on board, and Qualcomm aptX Bluetooth 4.1. On the top panel there are a handful of playback controls, an LED notification light integrated into the play/pause button, and five presets (which you can set to music services, inputs or internet radio stations via the relatively slick BluOS app). The Pulse Flex 2i can be portable too, thanks to an optional battery pack (£69) that fits to its back panel. Bluesound also offers wall brackets, to help incorporate a number of these speakers into a home cinema set-up alongside its Pulse Soundbar 2i and Pulse Sub 2i. 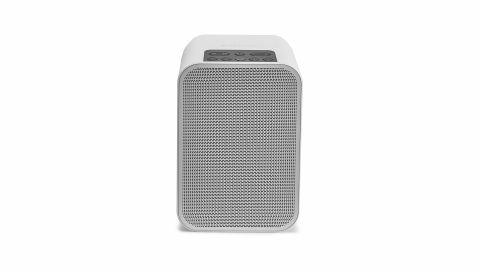 But our test focuses on the Pulse Flex 2i as a stand alone music speaker, and here, Bluesound’s light touch when comes to re-engineering appears to have paid dividends. Its retention of character from its previous incarnation means we are treated to that same confident, full-bodied presentation, only now more detailed and spacious. We’ve long been impressed with how big the Pulse Flex 2i sounds, but a little added sophistication has only served to heighten that impression. This new generation also feels freer to reach into treble frequencies and deal them with the same even hand as it does the rest of its output, while its considerable weight afforded to the bass remains taut and pleasingly agile. Just as previously, the scale of those low frequencies helps the Pulse Flex 2i support the midrange and in particular deliver vocal tracks with richness other speakers of this size may only covet. That doesn’t mean voices are thrown forward unnaturally – Bluesound’s hold on organisation remains across most of the new range – but melodies are sensibly allowed to lead a track. The gains in sonic performance between the last generation and this, while not huge, are undeniably effective. But the Pulse Flex’s £299 price tag left it with ground to make up on emerging competitors, and the 2i version still falls just short of the demand. Audio Pro in particular has skewed the market by offering class-leading sonic performance at budget prices, meaning you can now buy the Addon C10 – its largest multi-room wireless speaker – for £30 cheaper than the Pulse Flex 2i. It isn’t the perfect comparison – given Bluesound’s more abundant features list and the less easily accommodated design of the Audio Pro range, these brands have different target audiences. But the latter does highlight the Pulse Flex 2i’s minor rhythmic and timing troubles, while proving there is quite a lot better pound-for-sound value on the market. We’ve always liked the Pulse Flex, and its second generation is demonstrably more talented than the first. It might not make the necessary sonic gains to beat the current class leaders, but few wireless speakers offer this range of features with such an instantly likeable performance.